Announcing the Bingo Liner Bingo Room!! Gambling World is Proud to Present Bingo Liner! Have you played Bingo at a Bingo Room using Leap Frog Software yet? If not, you really need to. 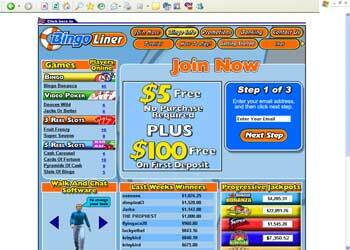 After your first visit to Bingo Liner, you will see how unique their software really is. It's a lot of fun being able to create your own little animated character that you maneuver around the bingo halls and slot rooms. The software allows you to customize this character to give it your own style. You are able to walk up to other visitors in the bingo rooms and at the casino and actually start a conversation with them. Using the built-in chat software allows you to literally chat with them. This is a great tool for building online friendships and quite often groups of people from all over the world will meet on a regular basis and enjoy bingo together. This bingo isn't just for fun either, (although they do also support play for free). You can play real bingo for real money and win big jackpots and tournaments with huge prizes on a regular basis. To help get you started and to introduce the free bingo software to even more players, Bingo Liner offers for first time account holders a Free $5. The $5 allows you to play 15 free bingo cards and up to 25 spins at the slots. They are so sure that after playing a while on the free 5, you will want to make a deposit and play some more. When you make your first deposit, you are offered a 100% matching deposit bonus up to a Free $100. They take this a step further and if you use Neteller to make your first deposit, you get a 200% bonus up to $100. Offering $5 Free To Try!